A book on the life of actor KIM Eui-sung has recently hit bookstands. In ‘Villain for 7 Years’, author and well-known professional interviewer JI Seung-ho asks the questions and actor KIM answers. In 1993, KIM made his debut with SBS’s The Faraway River but in 2000, he stopped acting and left for Vietnam for cinema business. Seven years ago, KIM returned to the big screen with Hong Sangsoo’s The Day He Arrives (2011). He has since been a prolific actor, appearing in movies like Inside Men (2015) and The King (2017) as well as TV series, such as Six Flying Dragons (2015) and W (2016). He recently made an especially strong impression playing villain Yong-seok in TRAIN TO BUSAN (2016). KIM puts all of his cards on the table in ‘Villain for 7 Years’. He talks about his life, movies and political and social views. “I hope my readers will be consoled and can laugh through the pathetic conversations between an actor living as villains for seven years and an unstable interviewer. I also hope no one will be hurt by this book.” KIM said. In his recommendation for the book, actor JUNG Woo-sung wrote “I could feel a strange order in the rambling conversation between the interviewer and interviewee”. 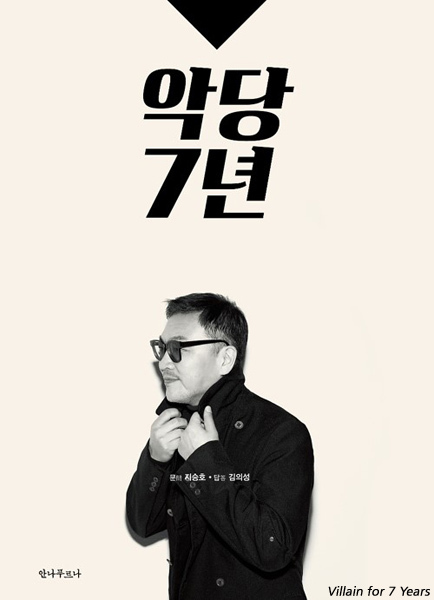 “It is a guide book for those who want to peep into actor KIM Eui-sung’s life of ups and downs.” said director CHOI Dong-hoon, who worked with KIM on Assassination (2015).